But this nerve-easing benefit goes even further when you eat proteins at breakfast. Researchers at the Franklin Institute explain that a morning meal high in protein raises your brain’s tyrosine levels. This helps your brain produce neurotransmitters called norepinephrine and dopamine, which give you energy and make you feel awake and alert. The Recommended Daily Allowance (RDA) of protein is 46 grams for women between 19 and 70 years of age, and 56 grams for men in the same age bracket. 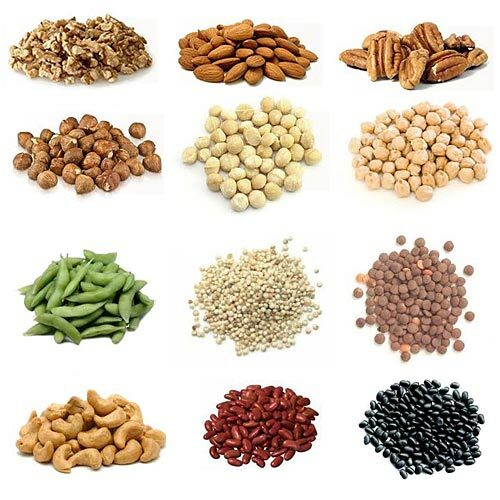 An ounce of dry-roasted sunflower seeds gives you 5 grams of protein. They also contain magnesium, known to be a stress-reducing mineral that nurtures the health of your nerves. Add them to hot or cold cereal, or try them on scrambled egg. Just 2 tablespoons of delicious peanut butter or almond butter, and you have about 8 grams of protein. Spread this on whole wheat toast, and enjoy a glass of skim milk for an additional 8 mood-boosting grams of protein. 8 ounces of Greek yogurt gives you 11 grams of protein per serving. Studies have shown that the naturally occuring probiotics in this yogurt relieve stress and anxiety. A whole wheat sandwich with hummus, almonds, and goat cheese can provide up to 22 grams of protein. Categories: protein | Tags: breakfast, diet, protein | Permalink.